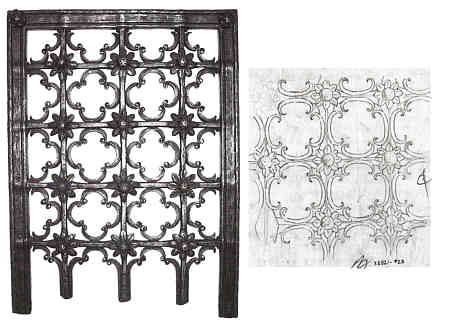 By the mid-nineteenth century, European ironwork was in decline due to innovations brought about by the Industrial Revolution. Cast iron was replacing the more time-consuming and skillfully made hammered iron, driving the decorative smith toward extinction. 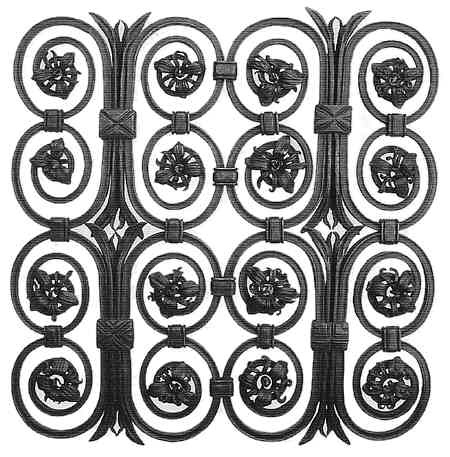 A French historian wrote that the last piece of decorative ironwork to be produced in the “glorious tradition” of wrought iron was made in 1809 and surrounded the choir in the Cathedral of Notre Dame. One hundred years later-in 1909-a young émigré named Samuel Yellin established a blacksmith shop half a world away and attempted to recreate the quality craftsmanship found in historic ironwork. Born in 1885 in a village near the Austrian boarder, Samuel Yellin apprenticed with a well-known Polish smith when he was only 12 sears old. For the next five years, in the traditional manner, young Yellin learned blacksmithing as a trade, a craft, and an art. In the journeymen phase of a typical European education, a novice smith was taught to recognize how lessons practiced during an apprenticeship fit into the broader context of a chosen field. In 1902, when Yellin left Poland to see ironwork throughout Europe , he reportedly had already achieved his master certificate. Within a few years, he left Europe to join his family in America . In Philadelphia he enrolled in the Pennsylvania Museum School of Industrial Art (today’s University of the Arts) and was soon incited to teach a metalworking class. Yellin established his first studio in 1909 with $150 of out-of-pocket capital. Inconveniently located on the top floor of a corner building in South Philadelphia , the site forced him to haul material up-arid finished pieces down through an open window. In 1915 he moved his operation to 5520 Arch Street , where he would work for the rest of his life. Yellin called his business “Samuel Yellin Metalworker,” a name that mould become synonymous with craftsmanship as his career progressed. “Samuel Yellin Metalworkers” is still in operation under the direction of the founder’s granddaughter, Clare Yellin. In identifying himself in relationship to his material-as a “metalworker” rather than as an artist or sculptor Yellin consciously promoted himself as a craftsman. An early Yellin piece, made in 1915, illustrates the grace of the artist’s hand. An iron bar was delicately drawn out to a fine taper to create a web of interwoven leaves and vines. 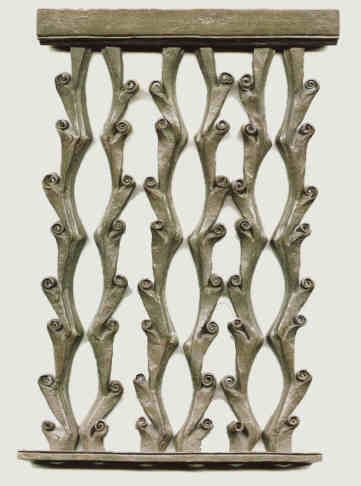 Each subsequently smaller branch intertwines to form a harmonious whole with an Art Nouveau lyrical fluidity. Such “graceful forms” would characterize Yellin’s work regardless of scale. 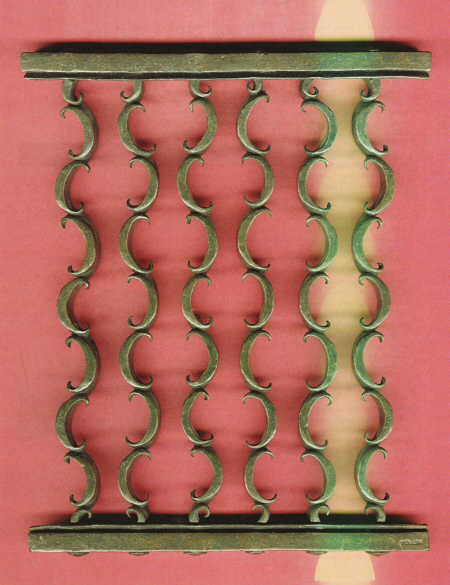 Yellin believed that appropriate design must be evident even in the smallest architectural detail, a belief made manifest in an iron door plate he fashioned, circa 1920. The outlines of the push plate converge and flow into a foliate terminus. In turn, the design rolls into itself as if to point the way for the hand to find its place and open the door. Surely a push plate would be considered a minor architectural element, but Yellin, through his subtle handling of the metal, imparts a sense of strength and grace to its modest form. Whether large or small, for public or private space, Yellin’s work was meticulous in its attention to detail. John Ruskin, champion of fine craftsmanship and the authoritative cultural voice during the late nineteenth and early twentieth centuries, could have been describing Yellin’s work when he wrote, “True ornament [must] be beautiful in its place, and no where else… [It should] aid the effect of ever portion of the building.”  Yellin himself stated, “It is most important that a piece of work shall be harmonious from ever point of view… for a piece of craftsmanship to be good not the smallest part should receive adverse criticism.”  Yellin was likely familiar with Ruskin and contemporaneous aesthetic theory through lively discussions with clients and architects, collectors and curators. Indeed, Yellin’s work put him in touch with the rich and the powerful, patrons who read like a Who’s Who of American industrialists. He produced work for sumptuous estates: Vanderbilt on Long Island, Mellon in Pittsburgh, DuPont in Wilmington, Eastman in Rochester, Ford in Detroit , Heinz in Pittsburgh. 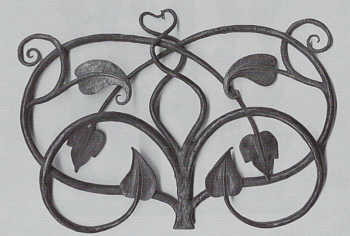 His commissions for important public spaces were many, including the Cloisters; universities including Princeton, Yale, Harvard, Columbia; the Grace Cathedral in San Francisco; and the Washington Cathedral in Washington D.C. Much of Philadelphia ‘s historic ironwork came out of Yellin’s shop. 19 x 21 x 1 1/2″This study was for a gate at the Washington National Cathedral, Washington D.C., 1935. Yellin’s studio benefited from the building boom that swept the country in the first rears of the twentieth century, when studio craftsmen received unprecedented support and shared a common belief in basic aesthetic principles. Ruskin had warned against, “The suggestion of a mode of structure or support, other than the true one…. The painting of surfaces to represent some other material than that of which they actually consist…. The use of east or machine ­made ornament of any, kind.” 8 In American studios these forbidden practices were translated and discussed in positive terms of exposed or “honest” construction, truth to materials, and the inherent value of handwork. But what is real craftsmanship? Is it the designing and production of work by methods tricky and inventive that will make the public marvel … Or is it the working out of good design in proper materials, in an honest tray? Yellin resisted the twentieth-century move toward separate, specialized tasks that would replace the nineteenth-century craftsman’s skill. During a period when the Ford Motor Company introduced the chain-driven assembly line, simplifying each worker’s task and regulating the speed at which each performed, Yellin’s shop retained the essence of individualized labor that characterized American studio craft, at least in theory. A discussion of Samuel Yellin’s oeuvre is not complete without mention of the ironwork he made for the Federal Resume Bank. Throughout his career he completed several bank interiors, including Equitable Trust in 1926 and a beautiful tellers’ screen for the Central Sittings Bank, 1929. Yellin’s work in the 1920 for the Federal Reserve was, perhaps, the largest commission of wrought iron ever created in the United States . To complete such a massive installation, he fashioned 200 tons of wrought iron, a feat that rivaled the output of many large factories of the day. 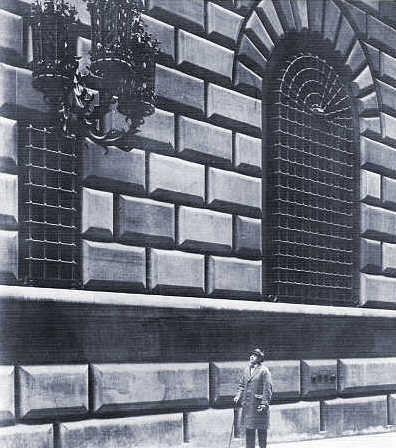 Yellin’s operation grew; he added a second building to the Arch Street complex and eventually employed more than 250 men. Samuel Yellin’s emphasis on the materiality of his designs places him alongside Gustav Stickley and Annie Albers as an early master of the Studio Craft movement. the first generation of American craftsmen to make their mark on the new century would attempt to formulate a theory in which their work would be appreciated on a par with fine art, drawing from the theories of Ruskin and his disciple William Morris. These efforts coalesced into a movement that would sweep the nation into a new millennium. Theirs was a search for a true American style. While Samuel Yellin will ill be remembered for his masterful work in iron, he was adamant in his intellectual adherence to what I call the Craftsman Ideal. In lectures and writing, Yellin translated this ideal into a language consistent with his own experience. At the height of his mature career, Yellin taught at the University of Pennsylvania , lectured at the Architectural Club of Chicago and Architectural League of New York, traveled to Europe , and consulted for the Philadelphia and Metropolitan museums. 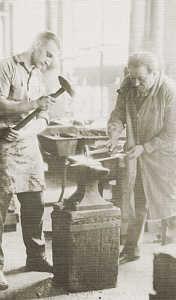 Yet he continually refined his persona as craftsman and underscored his identity by self reference as a “blacksmith.” In his insistence on design suited to function, his use of appropriate materials, and application of proper techniques, Yell in epitomized the search for a craftsman ideal. Henry Havard, Dictionnaire de l’ameublement et de la decoration (Paris, 1888-92) as quoted in Richard Wattenmaker Samuel Yellin in Context ( Flint , 1985). C. Matlack Price, “A Modern Craftsman in Wrought Iron: Work that Rivals the Industrial Achievements of the Middle Ages,” The Craftsman XXII, no. 6 (1912): 627-634. Ruskin, “Treatment of Ornament,” Stones of Venice numbered Artists Edition (NY Merrill & Baker, 1851) 236. Samuel Yellin, “Design and Craftsmanship,” Architect Club of Chicago (lecture) 1926. Samuel Yellin Metalworker, Memo, June 20, 1930 . Samuel Yellin, “Iron in Art,” In Encyclopedia Britannica, 1925; 14th ed. (1940) 679. John Ruskin, Seven Lamps of Architecture, numbered Artists Edition (NY Merrill & Baker, n.d.) 39. Sam net Yell in, “The Architect and the Craftsman,” Western Architect (Sept. 1929), 93. Anna Fariello, an independent curator with Curatorial InSight, is co-­editor or Objects and Meaning, forthcoming from Scarecrow Press. All photographs courtesy Clare Yellin, Samuel Yellin Metalworkers.